I was on and off the phone with Chuck on the drive up to Milwaukee. Just making sure all things were going smoothly and more importantly to find out if their drive was going as easily as mine? It was unreal, really. I had got out of Wrigley, hit White Castle and was still going to make it to Miller Park over an hour before the game was scheduled to start. That’s just crazy! Worst yet, I had got nothing to tailgate with since I was under the belief that we would be pressed for time. As it turns out, I got there a while before the rest of them. This gave me time to get a parking spot, put my leg brace on and then once I knew where they were, start my walk over to their car amid the sea of Brewers fans yelling at me for having my Cubs jersey on still. You know, it was the usual, “They aren’t playing today” and “You’re not in Chicago.” or my favorite, “You do realize this isn’t Wrigley Field, right?” Sorry Brewers fans, but that is a mistake that NOBODY will ever make! When I got to Bob’s car, I noticed that he came prepared. You can tell he has done this a time or 30. He had the ice chest out and the beer was flowing. Very cool. Summer Shandy by Lieinenkugel, a great choice. Had a great time standing there, drinking a few cold ones with good friends, watching the goings on of others as they tailgated. Eventually it was time for us to head in for the game and as we started our walk in my phone starts blowing up! 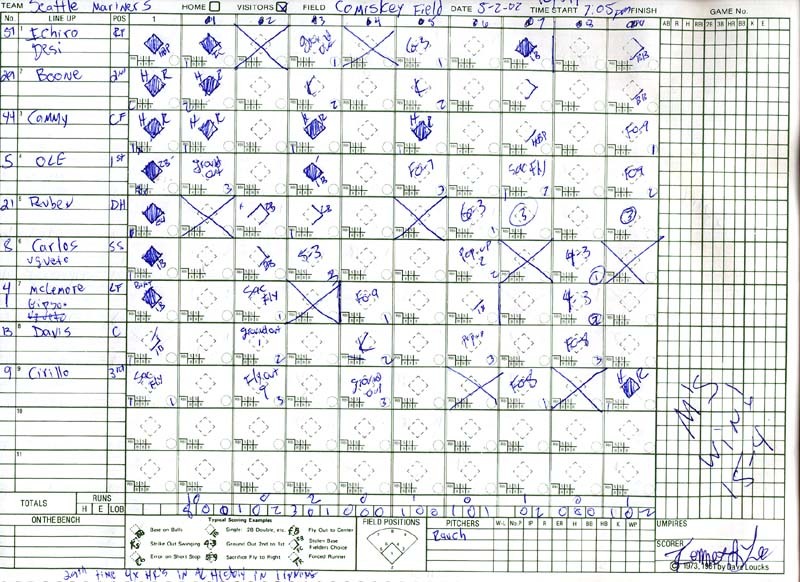 Between the texts and calls I found out that at Safeco Field, just 36 minutes from my house, Phil Humber of the Chicago White Sox, had just thrown a perfect game! I couldn’t believe it. In my back yard. At *MY* home park. A perfecto! I got pissed thinking I could have just missed that. People were texting me asking if I was there? Evidently they had completely forgot that I was doing this trip. The more texts I got, the madder I got until I realized 1 thing. The Mariner’s were playing the White Sox, ain’t no way I would have been there! LOL. However, I did know at least 5 people that were. Very cool for them. I have still not seen a No-No or Perfecto. 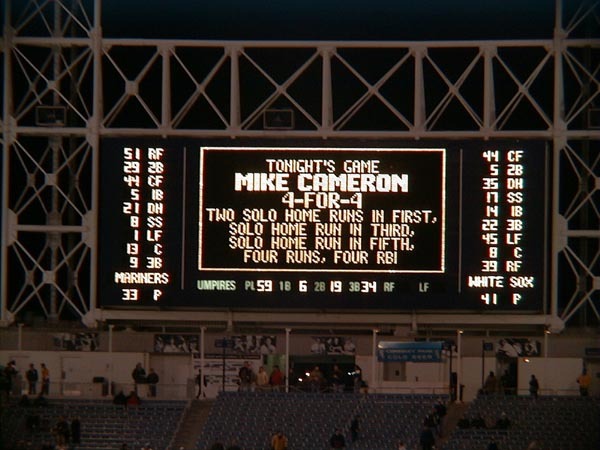 But as I told one of them who was there, as he was rubbing it in that he saw something so “rare”, “I’ve seen a 4 HR game and the ONLY time in MLB history that 2 teammates have gone back-to-back with HR’s TWICE in 1 inning.” It don’t get more rare than that. Though, I gotta admit, the ironic thing is that the game i am talking about was also vs the White Sox. 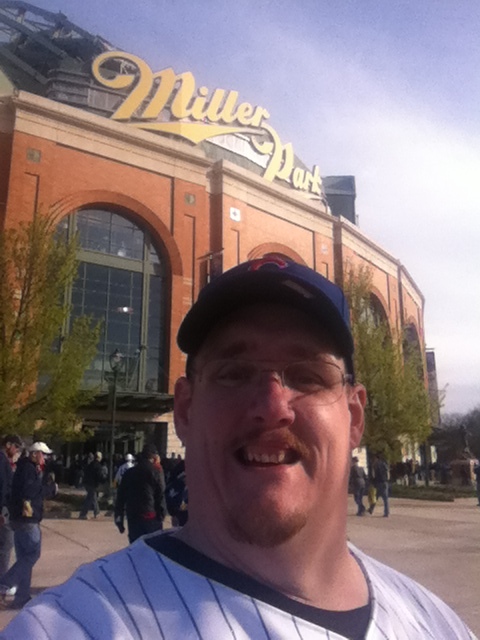 However, it was on the South Side of Chicago and I was there after attending the Noon game at Miller Park. After a quick stop for pictures by the “Miller Park” sign, we went in amid people still giving us (Bob also had his Cubs jersey on) a bad time for wearing our Cubs jerseys. It wasn’t as bad as earlier though and it eventually died down to nothing (until after the game). Bob had got us Club Level seats, which were great. Even better is that the 4 of us guys, Chuck being the smallest, were able to sit side by side in our seats. That was awesome. Our seats were basically just past 1st base and we had a great view of the park. I have never sat on this side at Miller Park, so I was excited to get to see the park from a different angle. Today was my 5th game at Miller Park. That seems weird to me because I know of nobody that says, “Hey, let’s go to Milwaukee!” To have actually been in Milwaukee that many times to be able to have now seen 5 games, that just blows my mind! The view from our Club Level seats. possible? 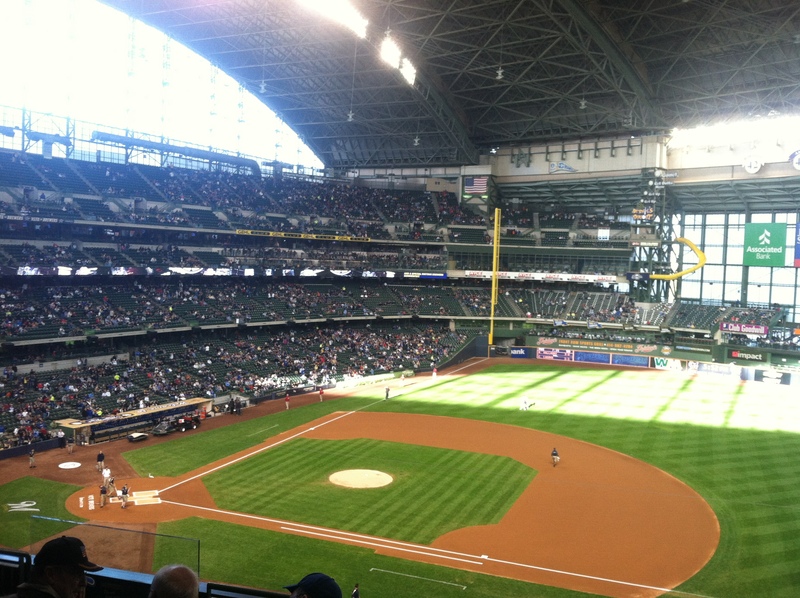 I actually really enjoy Miller Park, each and every game I have been to there has been fun. The people, in general (unless you are wearing Cubs gear evidently, lol) are great. One trip through, back in 2006, I was asked by the people I parked next to if I wanted to join them as they tailgated. That was cool, just to be able to experience it since it is illegal to do out here in Seattle. 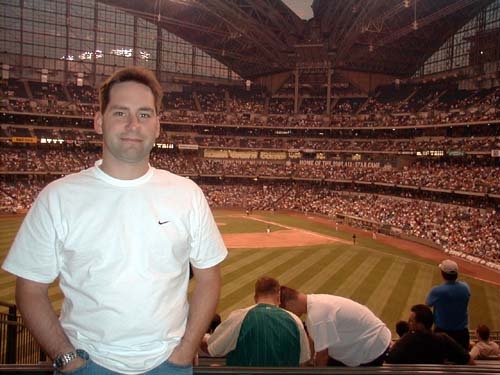 I’ve been to Miller Park 3 times by myself, the only other time I was here with someone was back in 2002 when my buddy Bob Mason joined me on a trip. Today, like 4 of the 5 times I have been here, the roof was closed. That was a bummer. The only time i have been here when it has been open was in 2002 with Bob Mason. Much like other ballparks with a retractable roof, this one has a completely different when it’s open vs when it’s closed. This roof opens different than the rest. While most have a rolling roof system that covers the field like a cap, this one kinda fans open from the middle. It’s pretty cool actually. As of today, the only retractable roof park I have been in without the roof open is Rogers Centre aka Skydome in Toronto. Would love to see that one open when I go up there to be able to see the view of the CN Tower you can get from the 3rd base side. Here is a link to my pictures from Miller Park.